Abstract. Methods for estimating mean transit times from chemical or isotopic tracers (such as Cl−, δ18O, or δ2H) commonly assume that catchments are stationary (i.e., time-invariant) and homogeneous. Real catchments are neither. In a companion paper, I showed that catchment mean transit times estimated from seasonal tracer cycles are highly vulnerable to aggregation error, exhibiting strong bias and large scatter in spatially heterogeneous catchments. I proposed the young water fraction, which is virtually immune to aggregation error under spatial heterogeneity, as a better measure of transit times. Here I extend this analysis by exploring how nonstationarity affects mean transit times and young water fractions estimated from seasonal tracer cycles, using benchmark tests based on a simple two-box model. The model exhibits complex nonstationary behavior, with striking volatility in tracer concentrations, young water fractions, and mean transit times, driven by rapid shifts in the mixing ratios of fluxes from the upper and lower boxes. The transit-time distribution in streamflow becomes increasingly skewed at higher discharges, with marked increases in the young water fraction and decreases in the mean water age, reflecting the increased dominance of the upper box at higher flows. This simple two-box model exhibits strong equifinality, which can be partly resolved by simple parameter transformations. However, transit times are primarily determined by residual storage, which cannot be constrained through hydrograph calibration and must instead be estimated by tracer behavior. Seasonal tracer cycles in the two-box model are very poor predictors of mean transit times, with typical errors of several hundred percent. 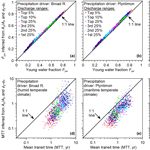 However, the same tracer cycles predict time-averaged young water fractions (Fyw) within a few percent, even in model catchments that are both nonstationary and spatially heterogeneous (although they may be biased by roughly 0.1–0.2 at sites where strong precipitation seasonality is correlated with precipitation tracer concentrations). Flow-weighted fits to the seasonal tracer cycles accurately predict the flow-weighted average Fyw in streamflow, while unweighted fits to the seasonal tracer cycles accurately predict the unweighted average Fyw. Young water fractions can also be estimated separately for individual flow regimes, again with a precision of a few percent, allowing direct determination of how shifts in a catchment's hydraulic regime alter the fraction of water reaching the stream by fast flowpaths. One can also estimate the chemical composition of idealized "young water" and "old water" end-members, using relationships between young water fractions and solute concentrations across different flow regimes. 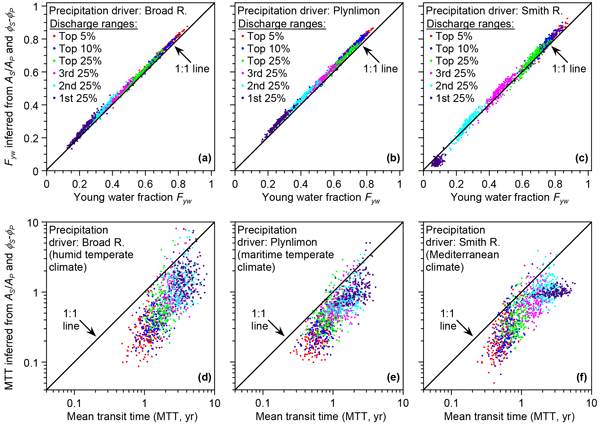 These results demonstrate that mean transit times cannot be estimated reliably from seasonal tracer cycles and that, by contrast, the young water fraction is a robust and useful metric of transit times, even in catchments that exhibit strong nonstationarity and heterogeneity. How to cite: Kirchner, J. W.: Aggregation in environmental systems – Part 2: Catchment mean transit times and young water fractions under hydrologic nonstationarity, Hydrol. Earth Syst. Sci., 20, 299-328, https://doi.org/10.5194/hess-20-299-2016, 2016. Here I show that seasonal tracer cycles yield strongly biased estimates of mean transit times in nonstationary catchments (and, by implication, in real-world catchments). However, they can be used to reliably estimate the fraction of "young" water in streamflow, meaning water that fell as precipitation less than roughly 2–3 months ago. This young water fraction varies systematically between high and low flows and may help in characterizing controls on stream chemistry.